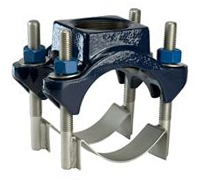 The JCM 406 Service Saddle is designed for hot tapping steel, ductile iron, cast iron pipe and PVC/plastic pipe. It utilizes heavy duty dual wide stainless steel straps. The 406 is Certified to NSF ANSI 61 standards.